Chance events trap hitch-hiker Al Roberts in a tightening net of film noir trouble--"Fate, or some mysterious force, can put the finger on you or me for no good reason at all." NYTimes: It's possible that one of the reasons "Detour" works so well is the almost complete absence of other people. Extras appear in some scenes, but most of the time the world looks abandoned, if not quite empty. The moral system is so rotten that Al feels guilty when he should be shaking his fist at God, or maybe a policeman. Although this is quintessential film noir, the landscapes are mostly shades of pale gray. Film Noir of the Week: The Al Roberts character should not be lumped in with other noir protagonists, as his reliability as storyteller is in question throughout. He laments his financial status, yet scoffs at a customer's generous tip. He speaks of his 'wonderful' romance with Sue, yet clearly they are of different temperaments. When debating whether to inform the authorities of Haskell's passing - doubting they'll believe the truth - he neglects to even investigate the man's medication and/or health. Al Roberts doesn't narrate the story we see - but the one he'd prefer we believe. 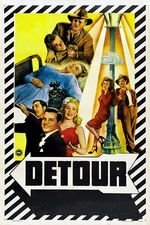 Roger Ebert: Most critics of “Detour” have taken Al's story at face value: He was unlucky in love, he lost the good girl and was savaged by the bad girl, he was an innocent bystander who looked guilty even to himself. But the critic Andrew Britton argues a more intriguing theory in Ian Cameron's Book of Film Noir. He emphasizes that the narration is addressed directly to us: We're not hearing what happened, but what Al Roberts wants us to believe happened. It's a “spurious but flattering account,” he writes, pointing out that Sue the singer hardly fits Al's description of her, that Al is less in love than in need of her paycheck, and that his cover-up of Haskell's death is a rationalization for an easy theft. For Britton, Al's version illustrates Freud's theory that traumatic experiences can be reworked into fantasies that are easier to live with. Maybe that's why “Detour” insinuates itself so well--why audiences respond so strongly. The jumps and inconsistencies of the narrative are nightmare psychology; Al's not telling a story, but scurrying through the raw materials, assembling an alibi. Consider the sequence where Al buries Haskell's body and takes his identity. Immediately after, Al checks into a motel, goes to sleep, and dreams of the very same events: It's a flashback side-by-side with the events it flashes back to, as if his dream mind is doing a quick rewrite. If you somehow plotted a graph of greatness vs budget, I think Detour might be the most extreme outlier on the good side. You might need to limit the scope a bit further, to fictional movies that were shot on film and which came out of Hollywood, but still. Apparently this script almost went to Warner Brothers--John Garfield had read it and supposedly it may have starred him opposite either Ann Sheridan or Ida Lupino. I can't really imagine anyone else in Vera's role other than Savage. She was just so amazingly despicable. A bigger budget probably would have ruined Detour. It's such a great example of the coming together of so many factors so influential in noir--the rise in pulpy crime fiction, reflections of American social upheaval through the Great Depression and WWII, the desirability to fill movie houses with cheap B-movie pictures in addition to the headliner productions (and the creativity that was required as a result of having to work on such tight budgets), and the influence of expat European directors. Cramming the story into just over an hour is probably the best thing that could have happened to this film.